Q: I am implementing in-app purchase and must register my product identifiers. What are product identifiers and how do I create and use them in my application? A: A product identifier is a string used to uniquely identify every product you wish to sell from your application. The App Store uses it to retrieve information about a product. It is a string identifier that can only contain alphanumeric (A-Z, a-z, 0-9), underscore (_), and period (.) characters. You can use any sequence of these characters for your identifier. However, we recommend that you use the reverse domain name style (for example, com.companyname.application.productid) when creating your identifier. Note: Product identifiers are not related to your App ID or Bundle ID. They may look like Bundle IDs, but they are not equivalent to them. Hence, you should not use your App ID or Bundle ID in lieu of your product identifiers in your code. How do I create a product identifier? See Create an in-app purchase for more information on how to create a product identifier. Important: You cannot edit a product identifier after you have created it. Furthermore, you cannot reuse product identifiers for products that have been rejected during App Review. Figure 1 displays the com.samplecode.planners.plates.round.7days, com.samplecode.planners.coins.100, com.samplecode.planners.tutorial.1, and com.samplecode.planners.maps.7days product identifiers for the Planners app. Figure 1 In-App Purchase items in iTunes Connect. How do I use a product identifier in my application? You create an SKProductsRequest object, then pass your list of product identifiers to its init(productIdentifiers:) method to retrieve information about your products. See Listing 1 for an example that requests information about the products associated with the product identifiers shown in Figure 1. Listing 1 Retrieving product information. // Keep a strong reference to the product request. // Initialize the product request object with the above list. //Attach the request to your delegate. // Send the request to the App Store. Updated screenshot and broken links. Updated the "How do I create a product identifier?" section. 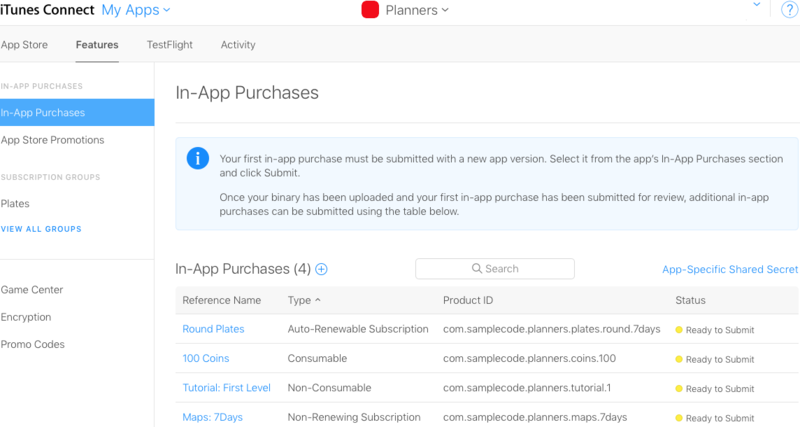 New document that describes how to create and use product identifiers for in-app purchase.